I confess. It was curiosity about the much vaunted “original” panizza that had me trooping to Paco Park one weekday afternoon. I have tasted panizzas from all over. I’ve loved some, said, “Meh,” about some, but my wanting to try the legendary original never waned. Living South of the Metro though, it was a tall order to drive to Pampanga just for a bite of pizza. Fortunately, my wishes were answered when My Kitchen by Chef Chris opened at Oasis Park Hotel in Paco, Manila. 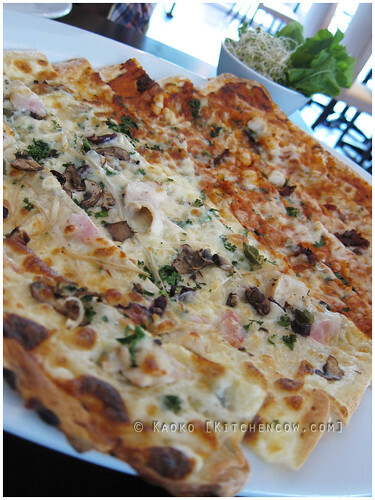 Our reason for trooping to Paco — Panizza! Chef Chris Locher’s C’ Italian Dining in Angeles, Pampanga has made quite a name for itself among foodies. One of its claims to fame is the creation of the panizza, a large rectangular pizza made with a super thin, pliable crust that’s perfect for rolling. Cut into strips, then sprinkled with arugula and alfalfa sprouts before being rolled then eaten, this riff on the classic pizza has since taken the country by storm with the popular Dear Darla from pizza chain Yellow Cab as well as other restaurants who have come up with their own versions. Fortunately for us city dwellers, Oasis Park Hotel has ensconced Chef Chris in his own little kitchen, giving us a taste of his Italian cuisine (panizza included!) without having to drive to Pampanga. “We’ll have the Paco and the Verena,” I tell our polite, friendly server, when asked what our panizza selections would be. The Paco features herbed chicken, smoked bacon, mushrooms (portabello and golden), capers and kalamata olives. The Verena, on the other hand, showcases a cheese sauce laced with tomatoes and white truffle oil that’s topped with bits of scallops, prawns and sundried tomatoes. “But we’ll start with the Oasis Salad,” I add, naming what we assumed to be the house special. It bears the hotel’s name — that has to be it, right? 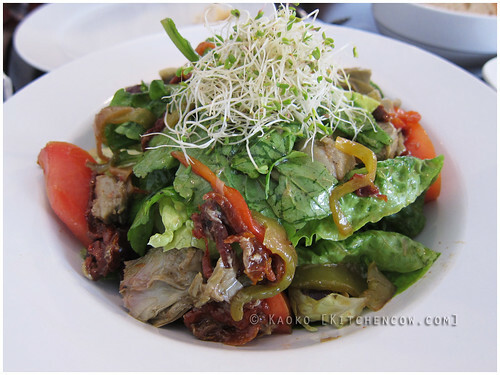 The Oasis Salad features artichoke hearts, roasted peppers, capers, caramelized onions, fresh and sundried tomatoes, kalamata olives, arugula and alfalfa, all heaped on a bed of crisp romaine, then dressed with a basic vinaigrette. I had my reservations about the salad when it came. It looked a tad drab. Artichoke hearts and roasted peppers aren’t the prettiest things when thrown in a salad. But a bite quickly appeased me as each salad component complemented each other — from meaty artichokes and roasted peppers, to salty and sour from the sundried tomatoes, kalamata olives and capers, a hint of sweetness from the caramelized onions and romaine finished by a peppery hit from the arugula. 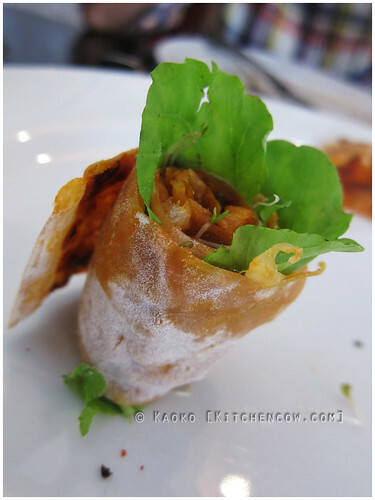 Do you have any idea how tough it is to shoot rolled-up panizza when you don’t have toothpicks? The day’s main event came soon after the salad, heralded by a gigantic platter with a large, thin pizza and a bowl of the ever present arugula and alfalfa sprouts. Chef Chris’s rustic, rectangular creation was extremely thin yet pliant, making it perfect for rolling. The toppings were mostly diced and sparsely scattered across the crust, allowing the pizza to remain thin, much unlike everything-on-it pizzas that have everything piled on top. Half of our pizza featured the meaty Paco, while the other half had the tangy tomato-based Verena. While neither side had very distinct components, the overall flavor, complemented by the peppery yet refreshing arugula and alfalfa made for perfectly flavored bites. Chili oil brought the flavors together, while for those looking for a bit of spice are encouraged to sprinkle chili pepper flakes. We ended up licking our plates clean, finishing every last salad green and pizza crumb. Thankfully, we got salad instead of pasta, leaving us room for dessert. 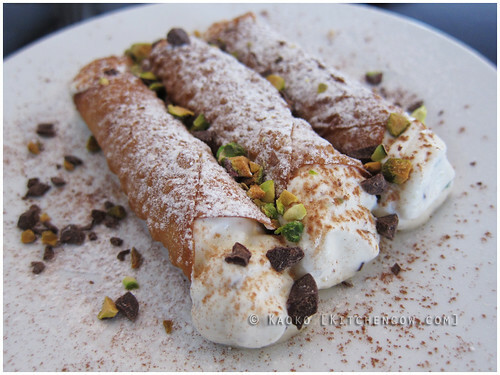 We’re not dessert people, but the Cannoli piqued our interest. A traditional Sicilian dessert that featured a crisp pastry shell piped with sweet ricotta cream then topped with pistachio nuts and chocolate bits, I jokingly called it a chichi, expensive, glammed up barquillo. Sure, I was being humorous, but my analysis isn’t far off the mark, nor is it a bad thing. The thin, crisp, tuile-like pastry shell paired with the just lightly sweetened creamy ricotta, nuts and chocolate was a wonderful way to end the meal, not just flavorwise, but texturewise as well as the soft, pillowy cream met the crisp crunch of the pastry and nuts. Our light lunch at My Kitchen by Chef Chris was definitely worth going out of our way for. The panizza had everything right going on for it. It goes to show that the original is still the best. The salad was pretty special, and the cannoli was a fitting end to the meal. Admittedly, eating there is a bit pricey, veering towards fine dining rates, despite the casual ambiance, but it’s a good place to try if you’re looking for good, quality food. I for one, am looking forward to trying the homestyle dishes. Maybe next time. My Kitchen by Chef Chris is located in Oasis Park Hotel, along Belen St. in Paco, Manila, across Paco Park. For reservations and inquiries, call them at (632) 521-2371. I’ve tried C’Italian in Pampanga, and I’ve been wanting to eat there again, but found the commute too troublesome. Great to know he has a new spot in Manila! My Kitchen + Dollie Shoot at Paco Park? Now we don’t have to trek to Pampanga to enjoy Chef Chris’s famous Panizza! Next stop, Paco Park!